"This recipe was my mom's. It's a soul food blast from the past. I adjust spices to my personal taste (I love lots of spices). Double the gravy recipe if you like lots of gravy. 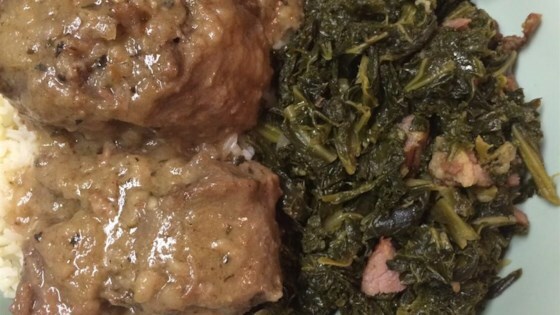 My family loves this dish served with rice." Place oxtails, garlic, onions, 1 tablespoon salt, 1 teaspoon pepper, Greek seasoning, and seasoning salt in a large stock pot. Fill with enough water to cover oxtails, and place over high heat. Bring to a boil. Cover, and reduce heat to medium. Cook for 2 1/2 to 3 hours. Remove from heat, and reserve 2 cups broth. Warm bacon drippings in a skillet over medium heat. Stir in flour, and cook for 3 minutes, stirring constantly. Stir in broth and browning sauce. Season to taste with salt, pepper, and garlic powder. Cook, stirring constantly, until gravy thickens. Remove from heat. Place oxtails in skillet, and stir to coat with gravy. Return to stove, and cook over medium-low heat for 5 minutes, stirring occasionally. See how to make a classic Salisbury steak recipe. The salt content shown in the nutrition information reflects the large amount of salt added to the cooking liquid, most of which is discarded. Usually cook oxtails in a crock pot so next time I'll follow the recipe and slow cook on low for 6 hrs. Great mix of flavors and the gravy was awesome. This is a keeper!